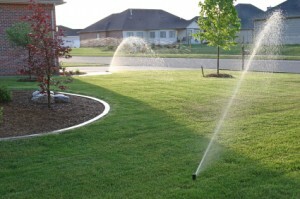 We service residential and commercial lawn sprinkler systems. Our service would include any type of repairs to the systems, additions to already established systems, up-grades, drip irrigation, turn-on and winterizing of systems. Due to plant growth over the years, water spray from the sprinkler heads can be blocked causing areas of property to not receive proper water coverage. We would then have to raise, relocate or replace sprinkler heads in order to give proper water coverage. Removing and replacing old sprinkler heads that are inefficient with new sprinkler heads that are more water efficient. Adding sprinkler heads or drip irrigation to already established zones or installing complete new zones which are sometimes needed due to new landscaping being installed in areas of the property that have no sprinkler system. Installing new updated city code pressure type vacuum breaker unit in place of old out dated non code atmospheric style vacuum breaker units. Converting old underground manual zone valves over to new 24v electric zone valves, along with a new timer, underground 24v multi strand valve wiring. Installing a Rain Sensor device that connects into the electrical part of the underground lawn sprinkler system. This device measures rainfall. When activated due to a certain amount of rainfall, the Rain Sensor will shut down the complete sprinkler system for one to two days depending on the amount of rainfall. When the sensor dries up, the sprinkler system goes back into automatic operation.